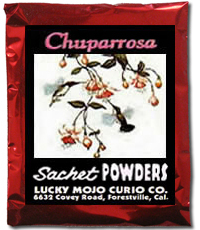 I just got my first order of Chuparrosa, I am looking to improve my relationship all the way around, including sexually and was wondering what else I could mix Chuparrosa with to bring on the sexual and physical attraction as well. I have on hand love me, kiss me now, marriage, follow me boy, fire of love, attraction, fast luck and stay with me. Re: what can i mix chuparrosa with? Kiss Me Now and Fiery of Love would be the best to add for sexual passion. I was having dinner at this guy's house I have a crush on. I put some chupparosa powder on his jacket and I also put some on his bong. I'm pretty sure he is going to touch them. The problem is I wasn't sure if I said any prayers when I put them on his belongings. I may have and it would only be like I wish he is attracted to me to date me or something like that. I have a feeling that he is attracted to me but he is shy or slow. Do you think I'm doing it right with the powder? He is someone I can see myself being in a relationship for a long time. I want to attract genuine guy for honest and serious relationship that's why I like the chupparosa. Any suggestions and advices are appreciated. Your prayers sound fine -- simple petitions are the most common kind of prayer work, especially when laying simple tricks on the spur of the moment, as we often have to do.